Enghien (Edingen in Dutch ; pop. 12,000) is a town at the boundary of the provinces of Hainaut, Walloon Brabant and Flemish Brabant, just on the linguistic border between French and Dutch speakers. The village of Marcq (or Mark in Dutch), adjacent to Enghien, holds its name from the Old Frankish marka, meaning "border", indicating that the linguistic boundary was probably already at this point in Frankish times. The town was founded by Englebert of Enghien in the 11th century. Its name is derived from the Frankish Ed or Oed ("serment"), + Inghen (field, meadow) to form "Edinghen" or "Edinghem". The first written mention of the name was "Adinghien" in 1092, then "Anghien" in 1147, "Aienghien " in 1227, and finally "Enghien" in 1264. Enghien became the very first barony of the powerful County of Hainaut (whose lords would become Emperors of Constantinople after the Fourth Crusade). Mary of Luxembourg (1462-1546), only daughter of Peter II of Luxembourg-Saint-Pol, inherited the seigneury of Enghien in 1526. She brought it to the Bourbon family through her marriage to Francis of Bourbon, Count of Vendôme, the great-grand-father of King Henry IV of France (1553-1610). Francis became the first Count of Enghien. Mary also brought the town of Condé-sur-l'Escaut (near Valenciennes, in the French Hainaut), which would be raised to the status of principality in 1546, with her grandson, Louis I of Bourbon-Condé (1530-1569), as first Prince of Condé. When Louis was made first Duke of Enghien, he transported the name of Enghien to the seigneury of Nogent-le-Rotrou, which he renamed "Enghien-le-FranÃ§ais" (now called "Enghien-les-Bains", a suburb of Paris, in the Val-d'Oise). The illustrious House of Bourbon-Condé, that went extinct with Louis Antoine de Bourbon-Condé (1772-1804), tenth Duke of Enghien, held its ducal and princely titles from towns in the County of Hainaut. In 1607, the Prince Charles of Arenberg and his wife Anne of Croÿ purchases Enghien from King Henry IV of France. 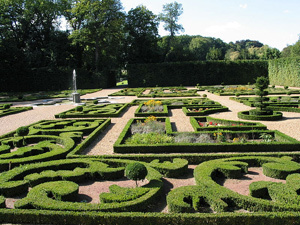 Between 1630 and 1665, the Arenbergs would create sumptuous French-style gardens, amongst the most beautiful of their time. The greenhouses of the park housed the richest collection of plants in existence at the time. Unfortunately, the park would be ruined by successive wars, revolutions, and the lack of care of some of its later owners. Baron François Empain, a wealthy financier and industrialist, acquires the domain in the early 20th century. He replaces the old orangerie by an attractive neoclassical castle. He would add a series of bronze and stone statues to the park, which can still be seen nowadays. In 1986, the park becomes the property of the town of Enghien, and the municipal government undertakes its renovation. 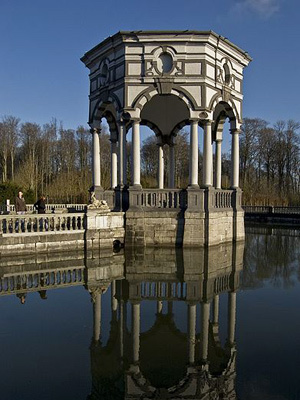 Pavilion of the Seven Stars in the castle park of Enghien. The main reason to come to Enghien is to visit its Castle Park, open everyday from 10:00 am to 6:00 pm (until 4:00 pm from November to March). Admission is 3 € (free until 7 years old). Among the highlights are the Dahlia garden (540 species), the Rose garden (over 800 varieties) and the heptagonal Pavilion of the Seven Stars, which has seven alleys radiating around it, one from each of its sides. The castle stands in the middle of the park, although it cannot be visited. Also note the local St. Nicholas church, with its atypical Gothic architecture, in front of the park entrance. 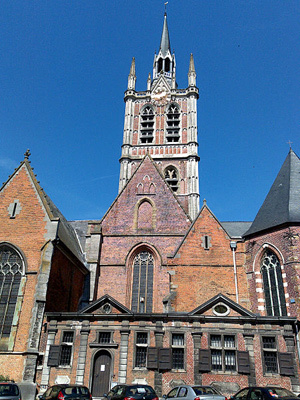 Enghien is about 35 km south-west of central Brussels, to which it is connected either by the N7 road or by the E429 motorway to Tournai. 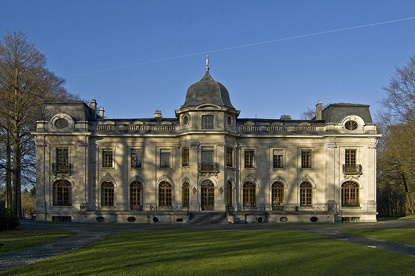 By train, Enghien is 25 min away from Brussels-Central, 35 min from Tournai and 20 min from Geraardsbergen.